Our little vessel was a forty-year-old sealer, well qualified to face rough work amongst the ice. The equipment of a Polar expedition calls for a very great deal of care and forethought, because, when once civilization has been left behind, it is not possible to repair any omis­sions, and a little forgetfulness may have serious consequences. A few words about our equipment may, therefore, prove of interest. The first essential was a hut for the winter quarters, since it was proposed that the Nimrod should not remain in the ice, but should return to New Zealand after landing the expedition and the stores. The hut was constructed of wood, and was taken south in sections, all carefully marked, so that it could be erected speedily on arrival at the winter quarters. The outside measurements of the hut were nineteen by thirty-three by twelve feet, and it was insulated with cork and felt as a protection against the cold. The original intention had been that the shore party should consist of twelve men, but finally this number was increased to fifteen, and there­fore the winter quarters were none too roomy. The question of the food supply was one of vital importance. We went to the best manufacturers, and in several instances were presented with some of our staple foods. The utmost care was taken to see that our foods were sound and good and suited to Antarctic needs, and the result has been that we have come through the expedition with­out one single case of illness due to our stores. Flour and sweetstuffs, such as jams, golden syrup, sugar, bottled fruit, and dried fruit, formed a considerable part of our supplies; for in the intense cold of the Polar regions there is a natural craving for sweet things and for such dishes as puddings made with flour. We had supplies of tinned meat, fish, etc., but we largely supplemented these by the use of seal meat during the winter, as the fresh meat would help to ward off that bugbear of all Polar explorers ­scurvy. The chief article of food for the sledging expeditions was pemmican, which we procured from Copenhagen; and in addition we had several preparations of a special character, designed to give the maximum of nourishment with the minimum of weight. These will be referred to again later on. We provided ourselves with thick "Jaeger" woolen clothing, and over this we wore thin wind-proof Burberry material, which proved most efficient in resisting the icy blasts. 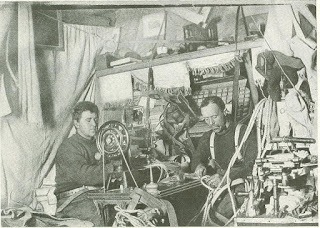 We had also the heavy pilot-cloth garments that have been used by other expeditions; but after carrying out some experiments during the spring sledging journey, I decided that we would not take the heavy cloth­ing on the journey to­ward the South Pole. The saving in weight was a matter of very great importance. The headgear was al­ways a source of diffi­culty. Indeed, every Polar explorer tries to devise some method of his own for keeping his face from being frost­bitten. It is not practicable to cover up the front of the face, for the moisture of one's breath would freeze on the covering, and frost-bite would result very quickly. For wearing about the hut in the winter quarters we had thick Russian felt boots, and for use on the march Lapland finneskoe, which are large boots made of reindeer skin with the furry side out. Into these we put dried sennegraes to absorb the moisture of the feet, and then there was room for the feet and three or four pairs of thick socks. These finneskoe were tied round with lamp-wick to keep them in place. Jaeger sleeping-bags and blankets were used in the hut, while for use on the march we had sleeping-bags of reindeer skin with the fur inside. Our tents were made of light Willesden duck, and were pitched over five bamboo poles, fastened together at the top. Three poles were put to windward and two to leeward, where was the door, a loose circular opening like a spout, which could be tied from the inside. Snow was piled round the snow-cloth at the bottom of the tent to make all snug. 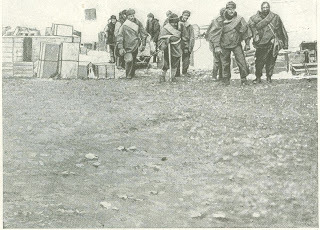 The sledges were a modified pattern of the Discovery sledges, and their general design is shown in the photographs taken on the southern expedition They were eleven feet long, made in Norway of specially selected timber, and they weighed about sixty pounds each, with straps and boxes for carrying oil. The way in which they stood the rough-and-tumble work on the ice was beyond praise. Petroleum and lamps of the Primus pattern were provided for the sledging expeditions, and the cooking vessels were of aluminum. This important part of the equipment proved quite satisfactory, for with the temperature well below zero we could turn snow into boiling water in twenty minutes. A coal stove and an acetylene gas plant were used in the winter quarters, a supply of coal having been landed from the Nimrod. A new departure was made by the use of Manchurian ponies and a motor-car. These ponies are probably the hardiest animals in the world. 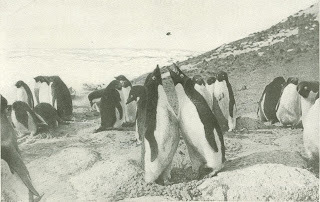 They are accustomed to living and working under conditions of extreme cold and to travelling over snow and ice, and their readiness to eat absolutely anything into which they can get their teeth was often a source of embarrassment to us. They would eat their harness or each other's tails if the least oppor­tunity were presented. I secured twelve of the ponies from a Man­churian village, and after a long voyage they were landed at Port Lyttelton, in New Zealand. Then they had to be broken in, and this work taxed to the utmost the skill and energy of some young New Zealand horsemen. Finally, I selected the best ten ponies and embarked them in the Nimrod for the journey down to the Antarctic. The motor-car was a New Ar­roll Johnston, specially adapted to meet the test of rough travelling in low temperatures; and. though it could not he used on the soft snow of the Barrier, it proved of value in drawing sledges over the sea-ice. The scientific equipment was the most com­plete we were able to secure, but lack of funds made it impossible for us to obtain everything that we would have liked. The members of the shore party, in addition to myself, were as follows: J. Murray, biologist, Dr. E. Marshall, surgeon and surveyor; R. Priestly, geologist; Dr. Forbes Mackay, surgeon; Lieutenant J. B. Adams, R.N.R., meteorologist; Sir Philip Brocklehurst, Bart., in charge of current work and photography; Ernest Joyce and Frank Wild, in charge of dogs and sledges; B. Day, chauffeur and electrician; G. E. Marston, artist; W. C. Roberts, cook and zoologist; Professor T. W. David, F.R.S., geologist; Douglas Maw son, B.E., B.Sc., physicist, geologist, and mag­netician; B. Armytage, in charge of the ponies. 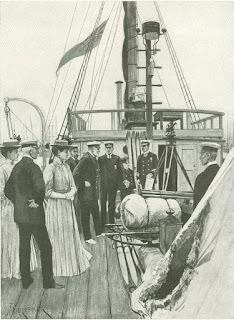 On the day on which we departed from Cowes, August 6, 1907, their Majesties King Edward and Queen Alexandra graciously came on board the Nimrod, an honour which was greatly appreciated by the expedition, and her Majesty the Queen gave into our keeping a Union Jack which was carried on the southern journey. 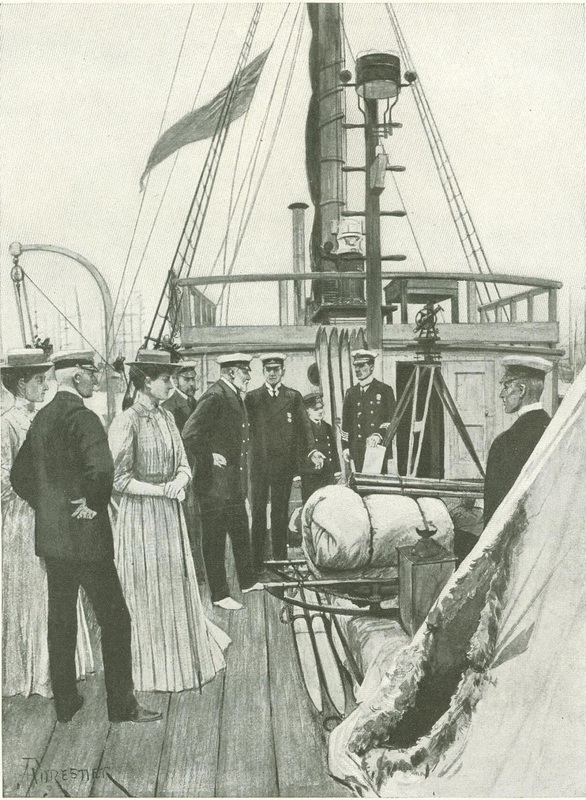 On January 1, 1908, we left Port Lyttelton for the southern regions. We had received from the people of New Zealand and Australia an amount of sympathy and assistance that I cannot adequately acknowledge, and the whole-hearted enthusiasm of the "send-off " given us at Lyttelton is one of the happiest mem­ories of the expedition. Over thirty thousand people cheered us from the hills and the accom­panying steamers as we moved down the harbour. We were towed down to the Antarctic Circle by a steamer (the Koonya) in order that we might save our coal, and this part of the journey proved rather trying. The weather was very rough, and the little Nimrod, deep in the water and handicapped by the weight of the long tow-line, laboured heavily. Frequently it was neces­sary to heave to, because we could not afford to risk a sea coming aboard and carrying away the deck cargo, which included the ponies, dogs, motor­car, and oil. The severe buffeting caused our vessel to leak considerably and necessitated constant work at the pumps. We lost only one pony, which fell over on its back during a hurricane and had to be shot. The weather cleared at last, and we sighted pack-ice about 1,500 miles from Lyttelton, after being towed for fourteen days. Our ves­sel was a little strained, but we had suffered no serious damage, and after casting off the tow-line and exchanging final messages with the steamer, we continued the journey southward under our own steam. 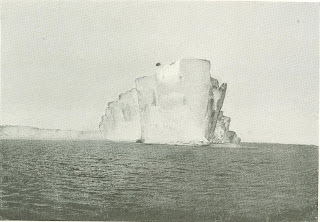 We went down the 178th meridian west, a new route chosen in order to save the Nimrod as much as possible from the pack, and after passing between hundreds of tabular icebergs by means of narrow lanes, we entered the Ross Sea, and passed along the edge of the Great Ice Barrier, the enormous cliff of ice towering high above the Nimrod's crow's-nest. 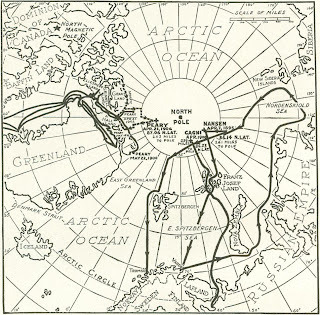 We found that impenetrable pack-ice barred the way to King Edward VII Land. Pack-ice is ice formed on the surface of the sea in the winter and broken up in the summer, when it floats northward toward the warmer regions and gradually melts away. 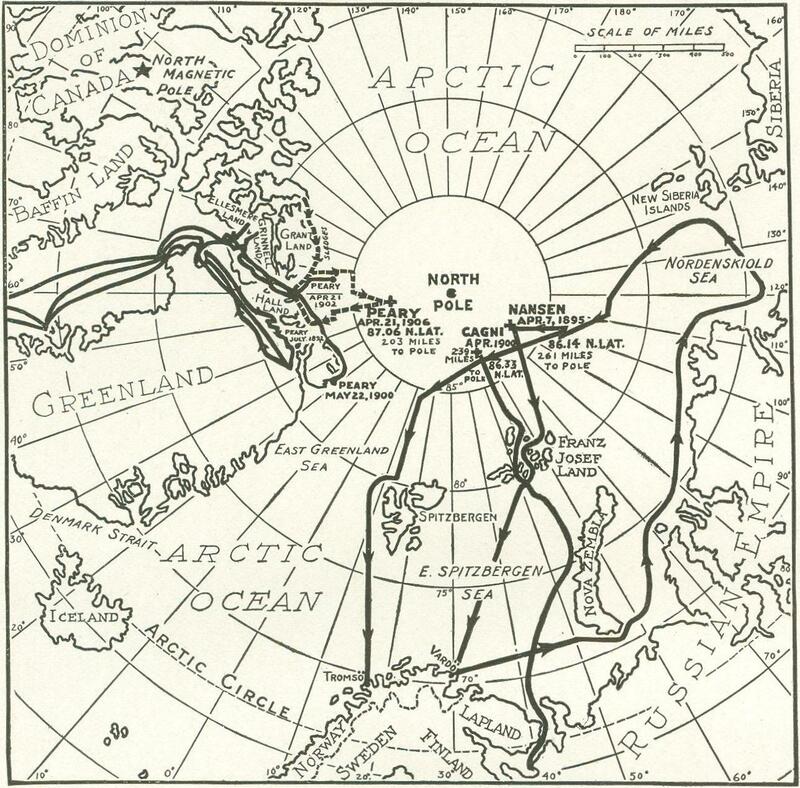 Our original intention to winter on the land discovered in 1902 had, therefore, to be abandoned, and we steamed to McMurdo Sound, and established our winter quarters at a spot twenty miles north of the point at which the Discovery ex­pedition wintered. 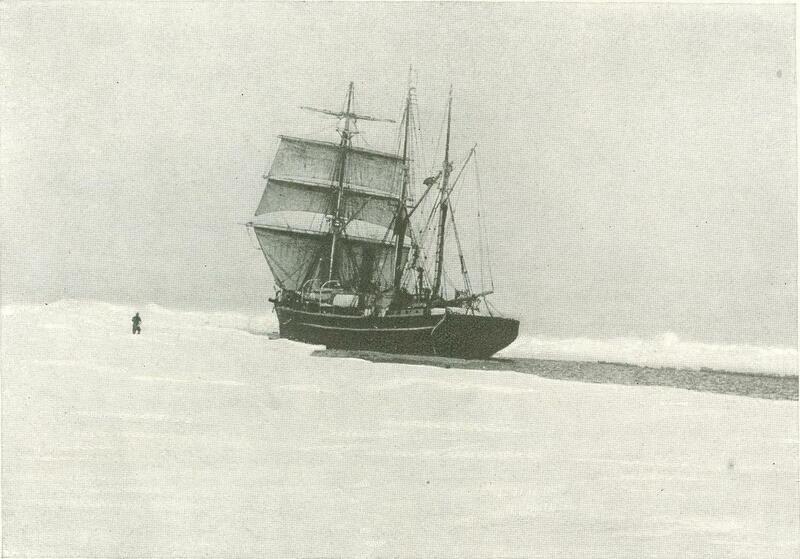 The next step was the unloading of the stores and equipment; but there was some delay before we succeeded in getting the ship into a position from which the work could be undertaken, owing to the condition of the ice. In the meantime a sledging party paid a visit to the bay in which the Discovery had wintered, and found the hut used by the previous ex­pedition practically clear of snow and quite in­tact. 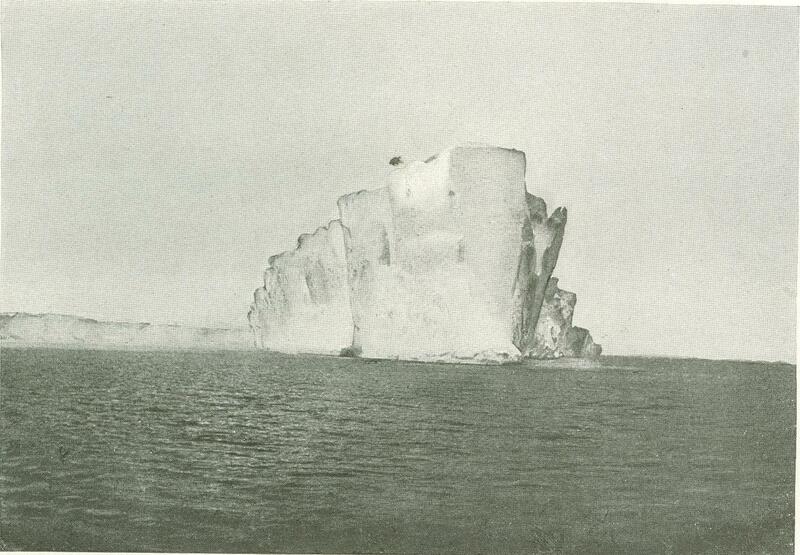 At last we got the Nimrod close into the shore, near the point selected for the hut on Cape Royds, and we proceeded to discharge our impedimenta, a good deal of which had already been got on deck. The motor-car was put ashore first, and then the ponies, for there was a chance of the ice breaking up, and it would have been almost impossible to land these in boats. A period of strenuous labour followed. 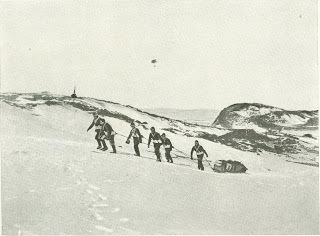 The hut had to be erected in a little valley close to the shore, and every member of the expedition had to assist in moving stores and equipment. When the weather became bad the Nimrod had to be moved to more secure moorings, so that we lost time, and on several occasions we had to find a new landing-place on account of movements in the ice. Once a floe on which we were working broke up suddenly, and we nearly lost a pony; and had it not been for the splendid efforts of the members of the expedi­tion during this trying time we should almost certainly have suffered the disaster of the loss or damage of a portion of our stores. A violent blizzard, which lasted for three days, was one of our trials. 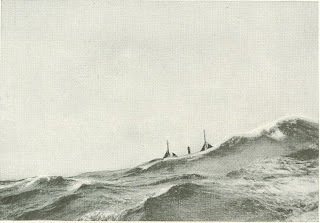 I was at sea in the Nimrod during those three days, and when I returned to the shore I found that the spray had been carried inland for nearly a quarter of a mile, and that our precious stores were buried in a mass of frozen sea-water, in places five or six feet deep. Our heap of coal was cased in ice, a fact that had probably saved the smaller pieces from being scattered far and wide. We had no time to attend to the stores then. It was imperative that the Nimrod should get away before the season had further advanced, and after a final rush to get coal ashore, our vessel steamed north on February 22nd, and left our little party to face the work which was to be done. 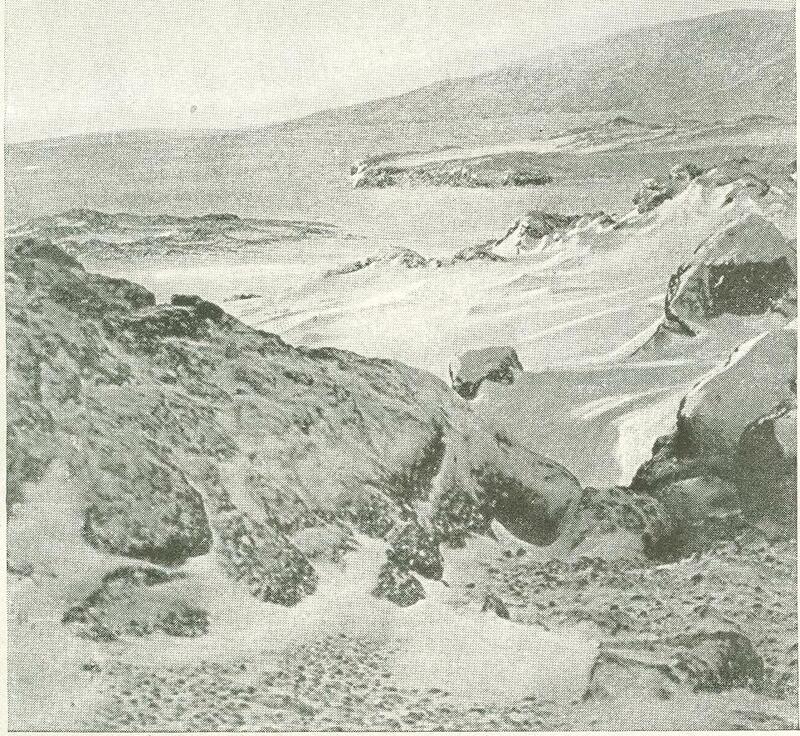 The most prominent feature of the land­scape in the vicinity of our winter quarters was Mount Erebus, and when we had rescued the bulk of our stores from the ice, with the aid of picks and crowbars, and generally settled down to Antarctic life, we were able to study this great volcano and the other features of the country. The scientific members of the expedition began to turn their attention to their own particular subjects, and interesting discoveries were soon being reported. The meteorologist was happy in the vicinity of Erebus, for the cloud of steam which ever hung above its sum­mit was a natural indicator of movements and conditions in the upper regions of the atmosphere. There was still plenty of work of a general character to be done. We used the cases in which our stores were contained to prevent the air from getting under our hut, experience having shown that the floor was the weak point in the matter of admitting the cold. A rough store-room was erected on one side of the porch for the issue of foodstuffs, and on the other side Mawson built rather an ambitious structure which was to be used as a chemical and physical laboratory. As a matter of fact it was used only as a store-room, because the temperature inside it was just about the same as that of the outside air, and the warm, moist atmosphere coming from the door of the but covered every­thing within the little room with fantastic ice crystals. At the lee side of the but was erected shelter for the ponies, cases of maize, bales of fodder, tarpaulins, and planks being used for the pur­pose. The hardy animals did not seem to be impressed with this provision for their comfort, and during their first night under shelter some of them, after making a great deal of noise, broke loose and returned to the valley where they had previously been tethered. Shortly afterward Grisi, the most high-spirited of the lot, pushed his head through one of the windows of the hut. A store-room, built on the south side of the hut, succumbed to the first blizzard, and after the weather cleared we had to organize a party to search for lost property. I found a Russian felt boot, weighing over three pounds, lying three quarters of a mile from the crate in which it had been packed. It must have travelled in the air, for it had not been scratched by the rocks over which it had passed. A dark room was constructed in a corner of the interior of the hut, the cases containing bottled fruit being used for the purpose, and in the opposite corner I had a tiny cabin, built of boards and roofed. Life in the hut during the winter was not uninteresting. Each two men had a cubicle of their own, seven by six feet, and fenced off from the rest of our little world by means of steel wires and canvas. The general handi­ness of the members of the expedition could be judged by the manner in which these rooms were fitted and decorated. One dividing curtain was painted to represent a fireplace, with a cheerful fire burning in the grate and a bunch of flowers on the mantelpiece - a cheering enough scene when the tempera­ture was low. Another curtain showed life-size drawings of Napoleon and Joan of Arc. Joan was tied to the stake and flames were playing around her in a manner no doubt in­tended to suggest warmth. In order to give as much room as possible in the centre of the hut, we arranged to have the table hoist­ed up to the roof when not required, and this left space for the vari­ous operations that were carried on by members of the ex­pedition. The stove was not a success at first, but investigation showed that this was due to the absence of several important parts which had not been put in when it was being erected in the hut, and after this omission had been made good it gave us every satisfaction. The stove was put to no light test, for it had to burn for over nine months, with an occasional break of not more than ten minutes on occasions when it was being cleaned. A meteorological station had been erected close to the hut, and here records were taken every two hours, sometimes in the face of blizzards that made work outside supremely unattractive. When we had settled down in the hut, we began to turn speculative eyes toward Mount Erebus. The ascent of the mountain had been regarded as very difficult, if not impossible; but there was no doubt that if it could be climbed the scientific results would be most valuable, and we decided that the attempt should be made. I selected Professor David, Mawson, and Mackay to try the ascent of the summit. They were to be provisioned for ten days, and a sup­porting party, consisting of Adams, Marshall, and Brocklehurst, was to assist the main party as far as possible. Eventually the whole six reached the top of the mountain. The party made its first camp at a spot about seven miles from the winter quarters, and 2,750 feet above sea-level. They started the next morning, with the temperature at ten degrees below zero, and, after strenuous climbing over snow furrowed by the wind during the whole of that day, managed to cover a distance of three miles and to reach an altitude of about 5,550 feet. The nature of the volcanic fragments lying around their camp suggested that Erebus had been pro­ducing a little lava quite recently. A depot was made at this camp, provisions for three days being taken on, and the third camp was made at an altitude of 8,750 feet, with the temperature at twenty degrees be­low zero. That night a blizzard swept down on the party, and in­creased in fury during the following day. Progress was impossible, and the men stayed in their sleeping-bags. In the afternoon Brocklehurst emerged from the three-man bag used by the members of the supporting party, and instantly the wind whirled away one of his wolf-skin gloves. He plunged after it, and was swept some distance down the ravine. Adams, who had emerged with Brocklehurst, was thrown down the ravine by the wind, and Marshall, who re­mained in the bag, had to struggle to save him­self from following, bag and all. Adams and Brocklehurst succeeded in creeping back to the bag, the latter almost exhausted, and both numb with cold. 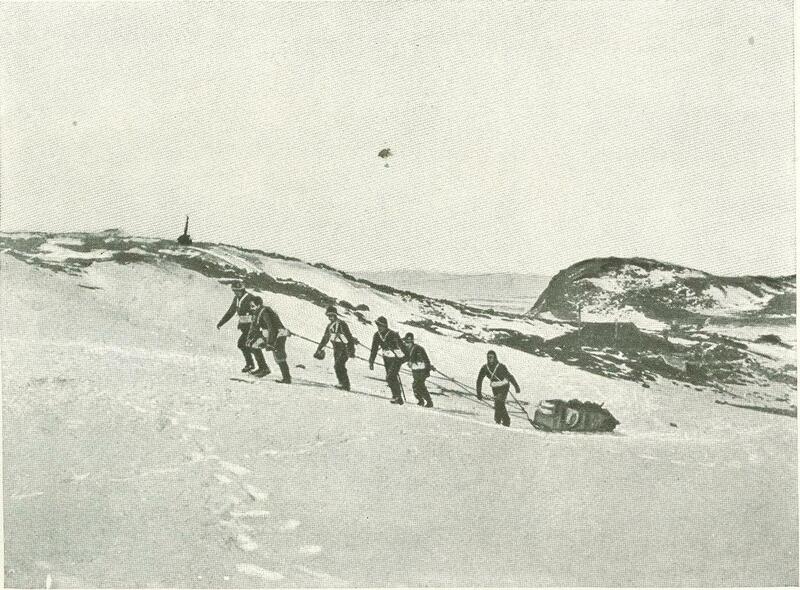 The party was able to proceed the next day, and after some more severe and dangerous climbing, in the course of which Mackay had a narrow escape from accident, they reached the rim of the old crater, above the southern end of which rises the active cone. They found themselves on the edge of a precipice of black rock, separated from the snow which filled the crater by a mighty moat scoured out by the blizzards. 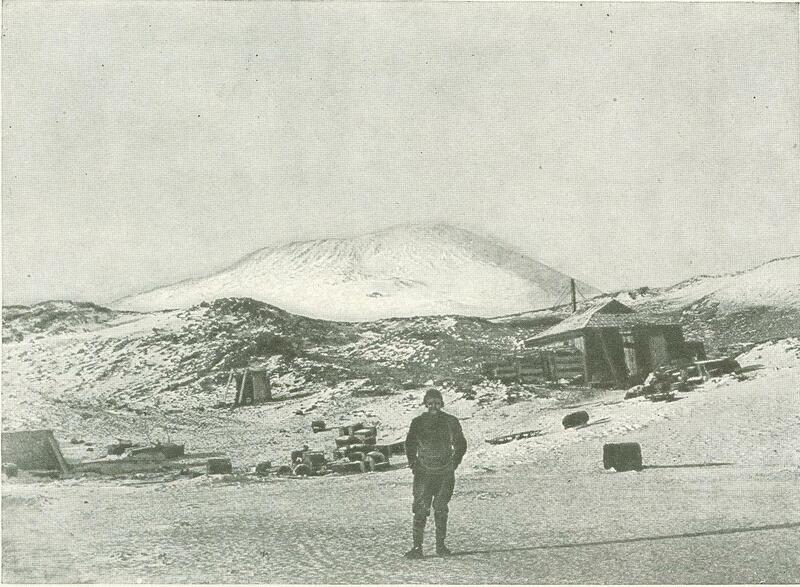 A camp was pitched in a little gully on the northwest slope of the main cone and about fifty feet below the rim of the old crater, and here an examination was made of Brocklehurst's feet, as he stated that he had lost all feeling in them for some time previously. It was found that his big toes were black, and that four more toes were also frost-bitten, though less severely. It must have required great pluck and determination on his part to have climbed almost continuously for nine hours with his feet in such a condition. After his circulation had been restored, he was left in a sleeping-bag, while the other five men pro­ceeded to explore the floor of the old crater. Their attention had been attracted to some curious mounds dotted over the snow plain within the crater, and it was to these they directed their steps. They found that the mounds were fumaroles, which in ordinary climates may be detected by the thin cloud of steam above them. The fumaroles of Erebus have their steam converted into ice as soon as it reaches the surface of the snow plain, and the result has been the creation of the remarkably shaped mounds. Some patches of yellow-coloured ice were found to contain sulphur. The next day the party made its way to the edge of the active crater, passing over beds of hard snow and vast quantities of felspar crys­tals, mixed with pumice, and climbing slowly and painfully because the altitude and the in­tense cold made respiration difficult. When they reached the crater edge - the first men to reach the summit of Erebus - they found them­selves standing on the lip of a vast abyss, filled with a rising cloud of steam. After a continuous loud hissing sound, last­ing for some minutes, there would come from below a big dull boom, and immediately great globular masses of steam would rush upward to swell the volume of the cloud which swayed over the crater. The air was filled with the fumes of burning sulphur. Presently a light breeze fanned away the steam cloud, and at once the crater stood revealed in all its vast extent and depth. It was between eight hun­dred and nine hundred feet deep, with a maxi­mum width of half a mile, and at the bottom could be seen three well-like openings from which the steam proceeded. 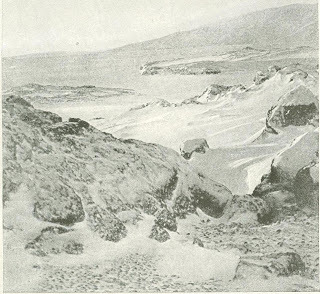 On the wall of the crater opposite to the party, beds of dark pumice alternated with white patches of snow, and in one place the existence of scores of steam jets suggested that the snow was lying on hot rock. The descent was rapid, for the party dropped down five thousand feet in four hours by glis­sading down the long ice slopes, much to the detriment of their clothes and equipment. They reached the depot made during the as­cent, to find that the blizzard had scattered their goods far and wide, and the last stages of the journey back to the winter quarters were made under trying conditions. There was every appearance of the approach of a blizzard; the men were tired out, the oil was almost gone, one of the tents had a large hole burned in it, and one of their stoves had been broken in the glissading. 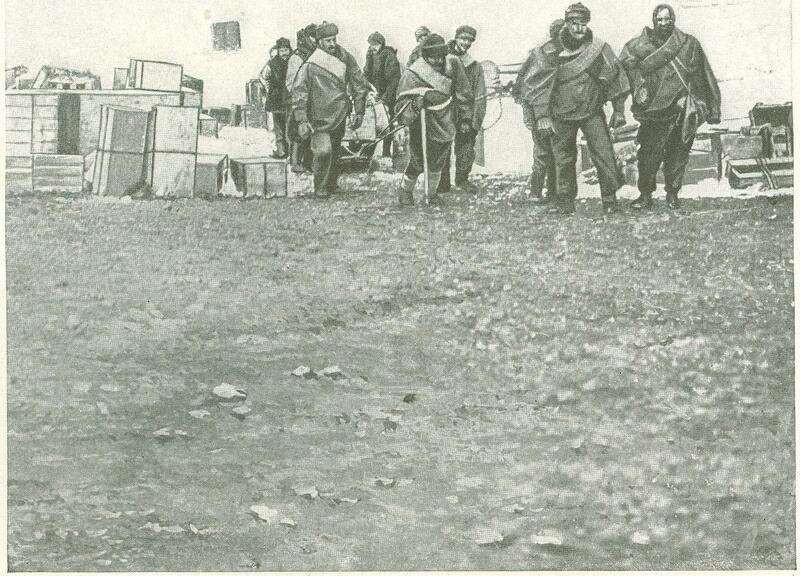 They abandoned their sledge and equipment at the spot on which they had made their first camp, and made a last forced march that brought them to the winter quarters in an ex­hausted condition. They had done their work, however, and within a few minutes they were forgetting their troubles in the enjoyment of an enormous meal. I will not attempt to deal in these pages with the results of the ascent from the scientific standpoint, beyond remark­ing that the party ascertained the height of the mountain to be 13,350 feet, and found that the moraines left by some gigantic ancestor of the Great Ice Barrier ascend the western slopes of the mountain to a height of fully 1,000 feet above sea-level. As the adjacent sea is at least 300 fathoms deep, the ice-sheet when at its maximum development must have had a thickness of not less than 2,800 feet. The long winter months were busy but not eventful. Every man had his share of work to do, and some of the investigations under­taken and discoveries made by the scientists were of a highly interesting character. We lived under conditions of steady routine, broken only when a blizzard rushed down from the icy south and made difficult and unpleas­ant the operations of feeding the ponies and dogs, fetching coal and supplies from the out­side, and taking the records at our meteoro­logical station. We played hockey and football in the open while there was sufficient light, and in the hut some of us amused ourselves with bridge, poker, and dominoes; while midwinter's day and birthdays were made the occasions of happy festivals; which helped to preserve our band from any attack of Polar ennui. Several of the members of the expedition employed themselves in the production of the "Aurora Australis," a book which was written, printed, and illustrated in our winter quarters. The covers of the volumes were made from wood that had formed parts of the cases in which our provisions had been packed, and the ama­teur printing establishment provided occupa­tion and amusement during the months of darkness. Gradually those months passed, and as the spring approached we began to get impatient for the day when we should be able to make a start with the sledging expeditions toward the two goals of our ambitions—the South Mag­netic Pole and the geographical South Pole itself. 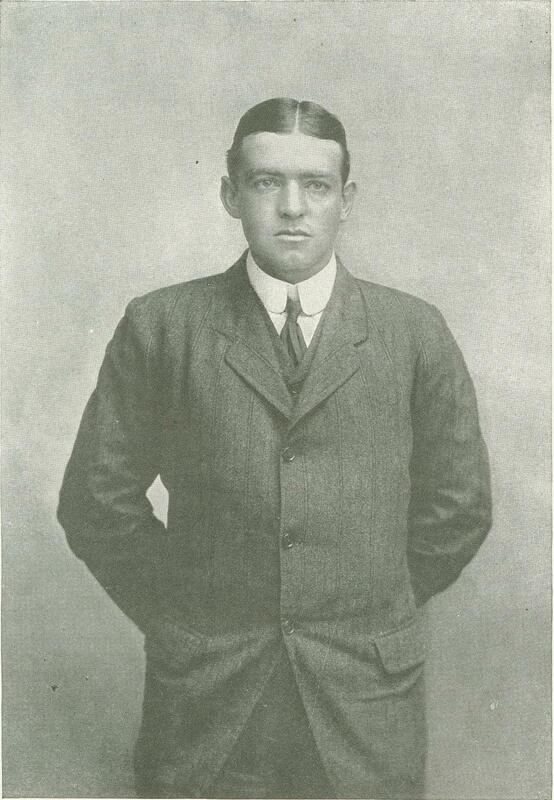 Note.— In the October number Lieutenant Shackleton will describe the famous sledge journey which resulted in his planting the Union Jack within one hundred and eleven statute miles of the South Pole, thus winning the record in Polar exploration.—EDITOR. 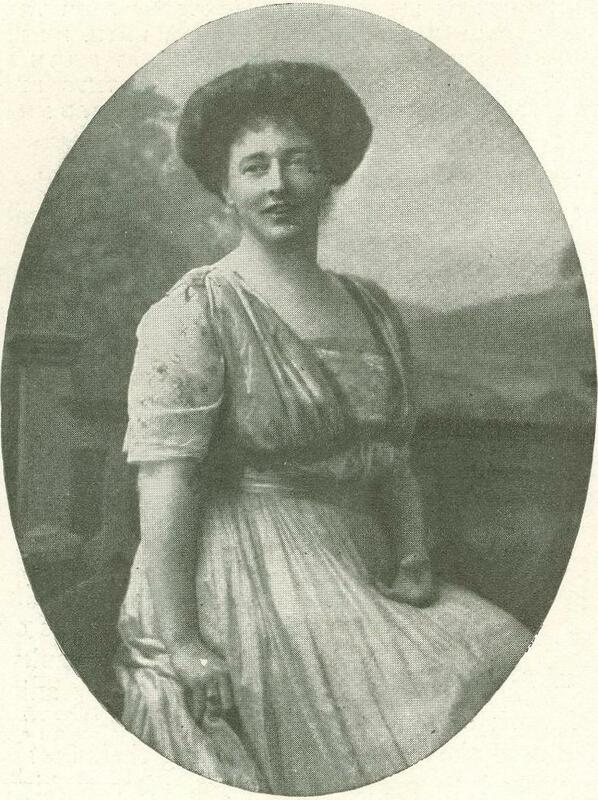 Originally printed in McClure’s Magazine in September of 1909.